The road to clarifying the geographical scope of the Clean Water Act is paved with legal potholes and regulatory roadbumps, legal experts say. Just withdrawing the rule (RIN:2040-AF30) intended to provide that clarity, in response to President Donald Trump’s Feb. 28 executive order, could take at least 18 months because it requires the agencies—the Environmental Protection Agency and the U.S. Army Corps of Engineers—to issue a notice of the action and solicit public comment. Rewriting, or revising the rule is a whole different ballgame. The agencies will have to justify why the regulation they plan to issue in place of the 2015 Clean Water Rule is better at protecting the nation’s waters. “It will be a tedious process to write a new rule, as tedious as it will be undo it,” said Hope Babcock, environmental law professor at Georgetown Law. The nation’s farmers, miners such as Peabody Energy, and home builders, which includes the MacDonald Companies in Texas and Willow Homes in Alabama, say they look forward to the revised rule, though they all admit that the process of pulling and rewriting the rulemaking won’t be easy. Trump’s executive order (E.O. No. 13778) directed the agencies to consider the late Justice Antonin Scalia’s plurality opinion in Rapanos v. United States (547 U.S. 715, 62 ERC 1481 (U.S. 2006). This order pits the competing opinions issued by Justices Scalia and Anthony Kennedy in how the Clean Water Act should be applied in protecting isolated wetlands and streams with an occasional flow. Where Scalia advocated a narrow reading of the Clean Water Act that is focused on protecting navigable waters from pollution, Kennedy pushed for an interpretation on the “significance” of the impact that upstream waters have on the health of navigable rivers. That means streams that are dry part of the time or only flow occasionally, including dry arroyos found in the Southwest, are out. Also out are wetlands that have no visible continuous surface flow to navigable waters, such as the prairie potholes, playa lakes and vernal pools. In Rapanos, Scalia rejected and parodied an opinion by Kennedy that was the lynchpin for the Obama administration’s attempt, through the Clean Water Rule, to define what is meant by “waters of the U.S.” or WOTUS. The WOTUS rule rested heavily on Kennedy’s significant nexus test, in which he sought to establish jurisdiction over certain isolated wetlands that aren’t directly connected to traditional navigable waters like rivers and lakes, but were determined by the agencies to affect the physical, chemical or biological integrity of downstream waters. Trump’s order to write a new water jurisdiction rule is clear that the agencies should rely on Scalia’s opinion but silent with respect to Kennedy’s reasoning. What isn’t clear at this point is whether the agencies will give more weight to Scalia’s opinion, considering that none of the courts have relied on it as the controlling view to uphold jurisdiction, according to Vermont Law Professor Patrick Parenteau who has been tracking how the courts have applied the various readings from Rapanos . Parenteau said all 10 federal courts of appeal that have considered the issue have stated that Kennedy’s significant nexus standard may be used to establish applicability of the Clean Water Act. 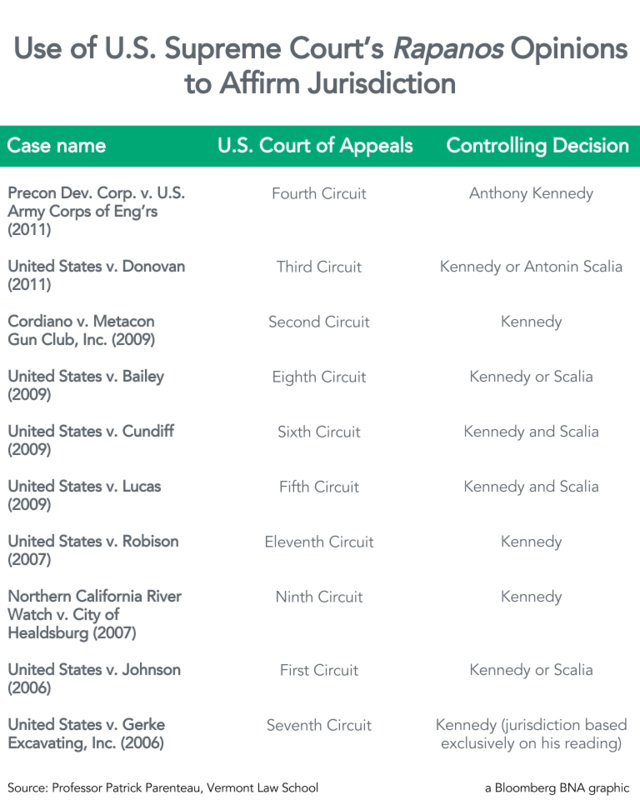 Of the 10, three courts of appeal have used either the Kennedy test or the Scalia test in affirming jurisdiction; one court has said that only the Kennedy test can be used; and two courts have said it wasn’t necessary to decide which applied because the wetlands in question met both, Parenteau said. EPA spokeswoman Julia Valentine told Bloomberg BNA that the agencies expect to issue a proposed rule that is consistent with the direction provided in Trump’s order, which published in the Federal Register March 3 (82 Fed. Reg. 12,497). At the same time, Valentine emphasized that the order “did not ‘direct the agencies to rely on Justice Scalia’s opinion,’ but rather instructs us to ‘ consider interpreting the term ‘navigable waters’,” as defined under 33 U.S.C. 1362(7), consistent with the late justice’s opinion. Another EPA official, who insisted on anonymity, said the agencies would solicit public comment when the notice proposing to rescind and rewrite the rule is published before committing or commenting on the direction the agencies would take. Ellen Steen, general counsel for the American Farm Bureau Federation, said she doesn’t believe the agencies will discount Kennedy’s reading of Clean Water Act jurisdiction. The Farm Bureau, which has opposed WOTUS and hailed its demise with cheers at its advocacy conference, has been backing the direction indicated by Trump’s order. The Farm Bureau backed the Federal Water Quality Protection Act (S. 1140), a measure by Sen. John Barrasso (R-Wyo.) and Joe Donnelly (D-Ind.) that was heavily influenced by Scalia’s opinion. Following Scalia’s opinion, S. 1140, which was introduced in the 114th Congress, directed the agencies to craft a rule establishing that Clean Water Act jurisdiction only extended to streams that have enough flow to transport pollutants at levels that would impair traditional navigable waters. The legislation fell short of the 60-votes required for floor consideration. Jon Devine, senior water attorney for the Natural Resources Defense Council, who strongly supported WOTUS, said it isn’t clear whether Kennedy’s opinion will be discounted because the order and the notice announcing the review both say that the agencies will “consider” adopting Scalia’s opinion. “But I think the signal that both things send is that they’re pretty likely to give it a try, and I presume that would mean discarding Justice Kennedy’s test altogether,” Devine said. For Devine, the biggest take away from this order is that Trump and EPA Administrator Scott Pruitt are “terrified” of trying to justify the rollback on scientific grounds. “They’ve probably realized that the scientific record would prevent them from convincing a court that tributaries and nearby waters aren’t important for downstream water quality, and that fact poses big problems if they wanted to argue such features don’t qualify for protection under Justice Kennedy’s framework. That’s likely why they want to change the legal test,” Devine said. Babcock, who is director of Georgetown Law’s Institute for Public Representation Environmental Law Clinic, agrees. “It took the agency four to seven years to come out with a new rule, and it wasn’t for lack of due diligence,” Babcock said. The agencies can follow whatever direction they get to write a new rule, but in court they will face a higher burden of proof to justify if the rule is less protective based on Scalia’s reading, she said. Jim Wedeking, environmental lawyer with Sidley Austin LLP in Washington, isn’t persuaded by arguments made by defunct rule’s proponents that a revised rule will not survive. “As long as the corps and the EPA do the rulemaking the right way it will get deference from the courts,” Wedeking said. Wedeking agrees with Babcock that courts require agencies to provide an adequate explanation for changing their legal rationale behind a rulemaking and why they believe this new view is important. “And if they do that then they will be afforded significant deference by courts,” he said. President Trump's executive order is available at http://src.bna.com/mHx.